For a weekend at least, James Hunt was able to put his wretched title defence to one side and secure his second successive win in the British Grand Prix. Unlike the previous year, there was no controversy and the victory was not later overturned by the FIA. 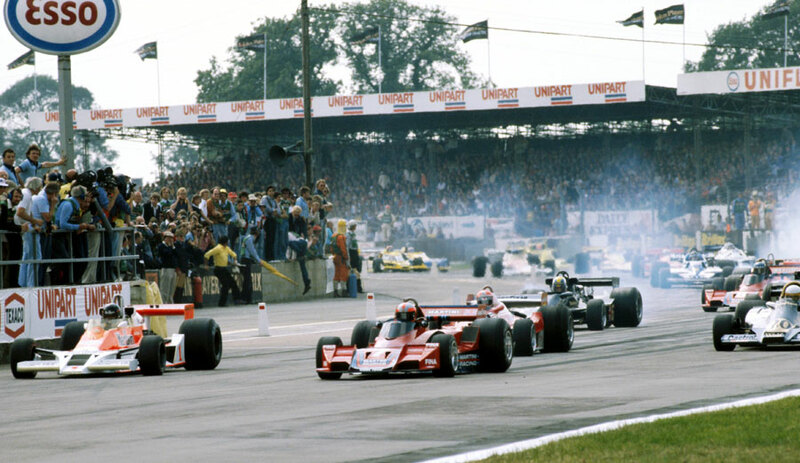 Hunt had struggled to get to grips with the new McLaren M26 but finally he appeared to be back to his title-winning form as he took pole; the crowd were left delighted as Niki Lauda joined him on the front row, promising a superb battle. But Hunt made a poor start which relegated him to fourth by the end of the first lap. Watson, who had been robbed of a win a fortnight earlier when he ran out of fuel on the final lap, was again undone by something outside his control when a broken fuel union cost him the lead and eventually forced his retirement. Hunt recovered well -aided by Watson's ill luck - and passed Lauda who was struggling with brake problems. Lauda skilfully nursed his car to retain second from the fast-finishing Gunnar Nilsson who emerged from his car covered in oil which had spewed out the Lotus of team-mate Mario Andretti. Hunt admitted his win was in part down to Watson's problems. "There was nothing I could do about him … I felt I was faster but there was no way I could pass him." He then said even when he took the lead he was very aware of the danger of running out of fuel and "obeyed orders and drove at half throttle for the last 20 laps". It was a bad weekend for those chasing Lauda in the drivers' championship as none out of Andretti, Jody Scheckter or Carlos Reutemann managed to finish. There was also interest in the performance of rookie Gilles Villeneuve who finished eleventh following an engine temperature gauge error in what The Times described as "a brilliant first appearance". The weekend also marked the debut of the turbocharged Renault which spent a lot of time trickling into the pits with steam coming from every orifice and was dubbed "The Yellow Teapot" as a result.